My wife, Kris, and I joined Way Out West in 1974. That means that we've celebrated Stan's birthday, with our Tent, probably close to 40 times. In fact, maybe we didn't miss any of the parties. That would make it 42. How time flies! On Tuesday night, May 23rd, at The Mayflower Club, guess what? We're going to celebrate again. We know that Stan's birthday isn't until June 16th, but isn't it fun to be the first Tent in the Sons to honor Stan's birthday this year! Our opening film for the evening will be the Boys silent, Putting Pants on Philip (1927). In the film, Scotsman and "girl chaser" Philip (Stan in a kilt) pays a first time visit to his American uncle Piedmont (Babe). Soon, the fun begins. In Perfect Day (1929), the Boys, their wives, and uncle Edgar (Edgar Kennedy) prepare to go on a picnic. It's Sunday, a beautiful day, and Ollie has his best buddy, Stan, at his side. What could go wrong? After giving damning testimony to convict a dangerous criminal (Walter Long), in Going Bye-Bye! (1934), the Boys quickly decide to get out of town. When they put an ad in the newspaper to find someone to share expenses, a lady (Mae Busch) answers the ad and says she has a friend who also would like to come along. In Thicker Than Water (1935), Ollie's domineering wife (Daphne Pollard) has an argument with Ollie and their boarder (Stan) about the missing payment owed to the local furniture owner (James Finlayson). When Ollie takes advice from Stan, as usual, that's when the trouble starts. Our closing film for the evening, a three reeler, will be The Laurel-Hardy Murder Case (1930). While fishing, Stan and Ollie read a newspaper that could quickly change their dire finances. It seems that Stan's wealthy relative, Ebeneezer Laurel, has died and his heirs are being sought for a reading of his will. When the Boys arrive at Ebeneezer's spooky mansion for the reading, they find Ebeneezer's relatives and the police, as Ebeneezer was murdered and all of his relatives are suspects. If a night of Laurel & Hardy films, singing Happy Birthday to Stan, and enjoying birthday cake doesn't get you out of your house on May 23rd, I have one more thing to add. A couple of weeks ago, Jim MacGeorge called me and told me that he wanted to come to our May meeting and entertain us again. Of course, I said YES! The Mayflower Club is located in North Hollywood at 11110 Victory Boulevard. Our doors will open at 6:30 p.m. and our meeting starts at 7:15 p.m. "Fisher Franks" (100% beef hot dogs) and your choice of chips will be sold from The Mayflower Kitchen. Refreshments will be sold from The Mayflower Bar. Free birthday cake will be served during our second break. Don't miss the celebration and all the laughs, see you at The Mayflower Club on Tuesday, May 23rd. To keep the cost of our Special Event meal (Saturday, September 16th) as affordable as possible, our Board has decided to have two raffles before our Special Event. We will have one raffle at our May 23rd meeting and one raffle at our July 25th meeting. We have already collected several raffle prizes, but if any members have Laurel & Hardy items that they think would be nice for raffle prizes, please bring them May 23rd and let me or Lori see what you have. Thank you. At our March meeting we screened The Music Box, Scram!, The Chimp, and Pack Up Your Troubles. Thanks to Dave Greim, J.T. Tropper, Laura Reuther, Bob Duncan, Victor D'Agostino, Alan Cowen, and Bob Brauer for helping me with the toasts and song. Thanks to our members our for their continued enthusiasm and support. Authors Rick Greene and Bill Cassara are currently working on a biography of Henry Brandon called "Henry Brandon King of the Bogeymen" and are asking for the help of all long-time WOW Tent members. If you have stories, interviews, rare photos, Tent visit photos or any material on Henry from any of his many Tent or Banquet or Convention appearances, please contact Rick. An entire chapter will be devoted to his Sons event appearances. The book is scheduled for release by BearManor Media in 2018, hopefully just before the Cincinnati convention. I don't think most of you know that Larry Byrd, a longtime member of our Way Out West Tent, passed away in April. If you weren't lucky enough to know Larry personally, a lot of you do know Larry from his work that was published in our tent's Pratfall. 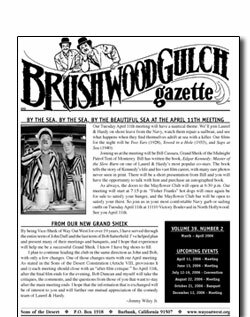 Larry was also the person that named this publication the Brushwood Gulch Gazette and drew the masthead on the front of the newsletter. My wife, Kris, and I met Larry almost 43 years ago. He was always a nice guy and so talented. Back in 1969, when the Tent started their own publication, Pratfall, Larry was one of its first reporters. By the end of Pratfall's regular run in 1982, Larry was the co-editor of Pratfall along with Lori Jones-McCaffery. Besides writing many articles for Pratfall, Larry did most, if not all, of the great artwork in Pratfall. We'll miss you Larry. Another longtime member of our Way Out West Tent, Suzanne Mueller, also passed away in April. Although you might not have known Suzanne by name, you certainly would recognize her. Suzanne loved to collect autographs and rarely missed a meeting, when we had a celebrity guest. The final plans for next year's International Sons of the Desert Convention in Cincinnati, Ohio are coming together. Direct flights between Los Angeles to Cincinnati take a little over 4 hours and are generally reasonably priced. While our tent always has a small contingency, we would really like to see more of our members supporting the International Conventions. If you have an interest in going, we encourage you to check out the convention website and talk to us at a meeting (or email us) so we can tell you more about what to expect at a Laurel & Hardy convention. The convention website is laurelandhardy2018.com and their Facebook name is Cincinnati2018.